Note taking during lectures is an important part of being a student. Research shows that reviewing notes is one of the best ways to succeed. Taking your own notes and reviewing is best, but almost as good is reviewing notes even if you don’t take them yourself. Here is good overview on some of the research on note taking. 3. Automatic notes with comments – record the lecture and add your own comments while the lecture is being recorded directly on your iPhone, or use your laptop. 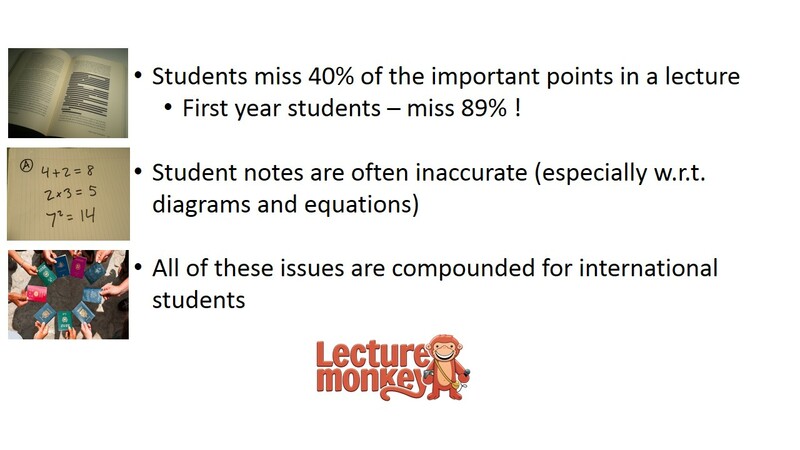 Of course you can always add bookmarks and comments later through LectureMonkey. As well as your own bookmarks and comments, you’ll benefit from your classmates’ comments through the “live comment “feature. So not only do you benefit from your own notes, everyone can chip in and benefit from the “wisdom of the class”. When class is over you’ll all have a completely accurate set of notes with all the important points recorded – what could be better than that? This entry was posted in Blog, Note taking strategy and tagged lecture capture, lecture notes, note taking, note taking guidelines. Bookmark the permalink.